After looking at past adoption rates on the PlayBook, it would be expected that the uptake of OS 2.0 on the device would be pretty fast, especially given that this was a major version number update. This turned out to be the case, and even more impressive then I expected. The chart below shows PlayBook OS versions on February 22nd based on downloads of the game Pixelated. PlayBook OS 2.0 was released on February 21st. Over 89% of users had already upgraded by February 22nd. 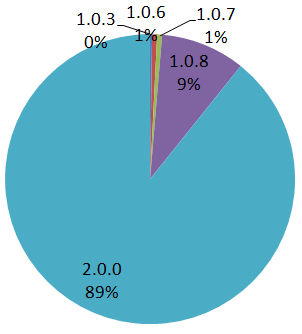 By the end of March, I would expect over 99% of users to be running the new operating system. On the old BlackBerry OS, it took 23 months for 89% of users to be running OS 5.0 (or higher), yet the PlayBook was able to hit this percentage less then 23 hours. So far the BBX operating system is showing itself to be thankfully free from any OS fragmentation issues.